These matches are all clipped, just a heads up. This match took place on May 3rd, 2016 and is part of the Catch The WAVE Tournament. Coming into the match, Shida has two point and Yamashita has no points, so if Yamashita wanted any chance of winning her Block she couldn’t afford to lose here to the popular Freelancer. She also has the added pressure of being one of the better WAVE wrestlers in the tournament, so she was repping her home base as well. They start fast as Yamashita lariats Shida out to the apron, Shida goes up top but she misses the missile dropkick. Mounted elbows by Yamashita but Shida returns fire and they go back and forth. Back up, hip attack by Shida and she hits a second one before sliding Yamashita’s head over the apron and hitting a knee lift. Backbreaker by Shida, and she covers Yamashita for two. Back up the two trade elbows, Shida goes off the ropes but Yamashita clubs her in the chest. Knee by Yamashita and she lariats Shida twice in the corner before covering her for a two count. Yamashita applies the sleeper but Shida quickly gets out of it and hits a series of knees. Yamashita gets the sleeper re-applied, but Shida rolls into the ropes to force a break. Shida blocks the backdrop suplex but Yamashita hits a vertical suplex instead before hitting the backdrop suplex for a two. Yamashita goes up top but Shida joins her and superplexes Yamashita back into the ring. Three Count by Shida, but Yamashita gets a shoulder up. Falcon Arrow by Shida, she goes off the ropes but Yamashita catches her with a lariat.She goes off the ropes but Shida this time catches her with a backbreaker before applying the Stretch Muffler. Shida picks up Yamashita and hits a backbreaker from a fireman’s carry, but the cover gets a two count. Shida puts Yamashita on the top turnbuckle, she goes for the backbreaker onto the turnbuckles but Yamashita slides away. Yamashita grabs Shida from behind and hits an avalanche backdrop suplex for a two count. Quick hurricanrana by Shida but Yamashita blocks the jumping knee and hits a lariat. Another lariat by Yamashita and she hits the Rainmaker for a two count. Yamashita bounces off the ropes multiple times before hitting Shida with a hard lariat, and she picks up the three count! Yamashita is the winner and gets two points in the tournament. This match took place on May 3rd, 2016 and is part of the Catch The WAVE Tournament. Coming into the match, both wrestlers have one win in their Block and with a win here would jump to the top with only one match remaining. Hamada is the Ace of WAVE (or at least one of them for sure), while Yoshiko wrestles out of SEAdLINNNG and has yet to be pinned since returning to wrestling in February. After a slow start, Yoshiko gets the first advantage as she slams Hamada’s head into the mat. Both wrestles go for shoulderblocks with no luck, they start trading elbows until Hamada hits a release German suplex. Front roll into a slap by Hamada but Yoshiko hits a lariat out of the corner before hitting some bootscrapes. Running boot by Yoshiko but Hamada applies an abdominal stretch, Yoshiko reverses it however and goes for a running senton, but Hamada rolls out of the way. PK by Hamada, and she covers Yoshiko for a two count. Hamada goes for a moonsault but Yoshiko rolls out of the way, enzuigiri by Hamada and Yoshiko rolls out of the ring. Hamada goes up top but Yoshiko quickly returns to the ring and joins her, Hamada flips over her and she hits a powerbomb. She goes for another one but Yoshiko gets out of it with a back bodydrop, big lariat by Yoshiko and she covers Hamada for two. Hamada comes back with her own lariat, she goes off the ropes but Yoshiko picks her up and hits a Samoan Drop. Running senton by Yoshiko, she gets on the second turnbuckle but Hamada avoids the diving senton. Hamada charges Yoshiko but ends up on the apron, and Yoshiko knocks her to the floor. Yoshiko gets on the apron and charges Hamada but Hamada lariats her in the leg, sending Yoshiko out to the floor as well. Hamada takes Yoshiko up on the apron and hits a DDT, Yoshiko falls to the floor as Hamada goes for a moonsault, but Yoshiko moves and Hamada lands on Takahashi instead. They pair battle on the floor as Yoshiko hits a running senton, but during this the time limit expires. The match is a Double Countout, so Yoshiko gets one point since she is the younger wrestler. This match took place on May 10th, 2016 and is part of the Catch The WAVE Tournament. Coming into the match, the veteran Nagashima has two points while the young Diana wrestler Tanaka has zero. If Tanaka wants any chance of winning the Block, she will have to overcome one of the most experienced wrestlers in the tournament. Tanaka attacks Nagashima before the bell rings, as young underdogs tend to do, and she hits a pair of hard shoulder tackles in the corner. Nagashima slides away from Tanaka and hits a big boot before kicking Tanaka out of the ring. Nagashima goes out after her and throws Tanaka into the chairs at ringside before sliding her back in the ring, Nagashima gets on the apron but Tanaka shoulder tackles her back to the floor. Tanaka tries to prevent Nagashima from returning to the ring before the count but she barely makes it, they trade elbows until Tanaka hits a rolling fireman’s carry slam for a two count. Tanaka goes up top and hits a missile dropkick, headbutts by Tanaka but Nagashima boots her in the head. Uranage by Nagashima, and she covers Tanaka for two. Nagashima goes up top but Tanaka avoids the footstomp, sunset flip by Nagashima but Tanaka rolls out of it. Tanaka catches Nagashima’s rana attempt and hits the rolling fireman’s carry roll again, she goes up top but she misses the diving senton. Big boot by Nagashima and she nails the Fisherman Buster for the three count! Nagashima wins and gets two points in the tournament. Probably my favorite part of the match was Tanaka trying so hard to win by count out, she knew her chances of beating the veteran via pinfall or submission were a bit slim. The match had a lot of repeated moves for a match that wasn’t very long, I liked the amount of fire that Tanaka showed but the action itself was a bit lackluster. Not a bad match but definitely a step down from the last two we watched. 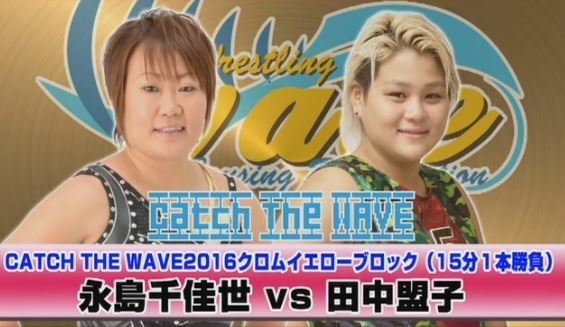 This match took place on May 10th, 2016 and is part of the Catch The WAVE Tournament. Coming into the match, the DDT wrestler Cherry has two points and Miu from JWP has none, so Miu needed some points here if she wants to win the Block in the tournament. Cherry quickly goes for an armbreaker and a triangle choke, but Miu gets a foot on the ropes to force a break. Miu sends Cherry out of the ring and dives out to the floor with a plancha suicida, Miu tries to stop Cherry from returning to the ring but she eventually manages to do so. Vertical suplex by Miu, she goes up top and she hits a diving footstomp for a two count. They trade pins with no luck for either, Stunner by Miu and she hits a German suplex hold for two. Dragon screw by Cherry and she applies a figure four, Miu rolls out onto the entrance way ramp but Cherry keeps the hold applied. She releases it and tries to get back into the ring, but Miu stops her and hits a hard elbow, sending Cherry off the ramp. Cherry tries to slide back in the ring but she doesn’t make the count as the bell rings. The match is a Double Countout, Miu gets one point since she is the younger wrestler. It is an interesting strategy we saw in the last two matches, as honestly getting one point isn’t probably going to be enough to help a wrestler win the Block anyway. but I guess one point is better than no points. Too short to get excited about and I think both of these wrestlers hover around the ‘average’ line, but nothing was done poorly. Overall not a bad match but utterly forgettable. 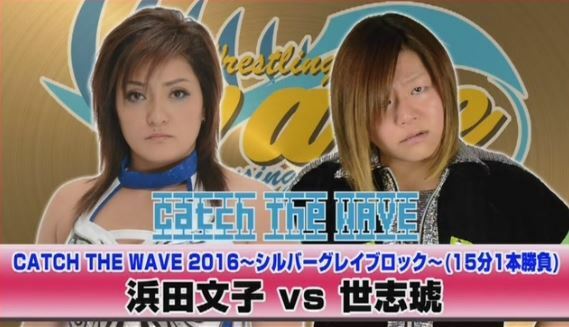 This match took place on May 10th, 2016 and is part of the Catch The WAVE Tournament. Coming into the match, Chisako from Sendai Girls’ has one point while Mii leads the Block with two points. A lose here would knock Chisako out of the tournament as she wouldn’t be able to catch up to Mii at that point. Chisako dropkicks Mii before she can even get into the ring, she takes Mii up onto the ramp and attacks her near the entrance. Back into the ring, Chisako slams Mii into the mat and hits multiple footstomps, but Mii comes back with a heel kick. We clip ahead to Chisako being back in control, Northern Lights Suplex by Chisako but it gets a two count. Chisako goes up top and hits a diving footstomp, Chisako charges her in the apron but Mii slides out onto the apron and hits a diving crossbody off the top turnbuckle. STO by Mii, she goes up top again but Chisako gets her feet up when she dives off. Crucifix slam by Chisako and she dropkicks Mii while she is in the corner. Chisako goes up top but Mii rolls out of the way of the Hormone Splash, La Magistral by Mii but it gets two. Big lariat by Mii, she goes up top but Chisako joins her all the way on the top turnbuckle to hit an avalanche cutter. Chisako goes back up top and nails the Hormone Splash, and she picks up the three count! Chisako wins the match and gets two points in the tournament. Chisako is so fantastic, she really didn’t get all the credit she deserved as for years she has been seen as just a tag team wrestler. This was too short/clipped to get excited about but everything that they showed us was really good. Mii stepped up and they were both hitting big moves to show how important these two points were, it wasn’t just your average mid-card match with nothing on the line. Not long enough to recommend but still fun to watch. 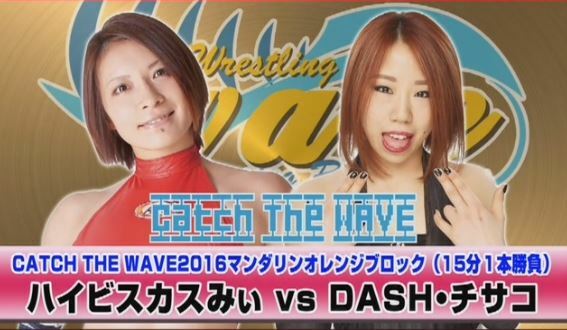 This match took place on May 10th, 2016 and is part of the Catch The WAVE Tournament. This is the second Shida match we have seen on this DVD, as she still only has two points after losing to Yamashita. The long time veteran Yoneyama also has two points, so a win here is crucial for both to win the Block. After the usual opening back and forth, Shida hits the big move of the match as she delivers a hurricanrana and hip attacks Yoneyama in the head. She goes for a knee lift but Yoneyama moves out of the way and hits a jumping knee off the apron. Yoneyama goes up top and dropkicks Shida in the back, she applies an ankle hold but Shida gets into the ropes. Shida rolls out to the entrance ramp but Yoneyama goes after her and the two trade elbows. Vertical suplex by Shida, she pulls Yoneyama to the turnbuckle as she gets on the second turnbuckle and she superplexes Yoneyama back into the ring. Backbreaker by Shida and she hits a second one before covering Yoneyama for two. Shida puts Yoneyama in the corner and hits a running knee, she goes up top but Yoneyama joins her and tosses her to the mat. They trade strikes with Yoneyama ending the exchange with two running knees, she gets on the second turnbuckle and she hits a diving senton for two. She goes for a diving senton off the top but Shida moves and hits a Three Count. Fireman’s carry into a backbreaker by Shida, but Yoneyama barely gets a shoulder up. Shida puts Yoneyama on the top turnbuckle but Yoneyama slides away from her and applies a jackknife hold for two. Chaos Theory by Yoneyama, but Shida again kicks out. Jumping knee by Shida and she hits the Falcon Arrow, but it gets a two count cover. They both go for quick pins and Shida hits a suplex, but the bell rings as the time as expired. The match is a Draw, Shida gets one point in the tournament as she is the younger wrestler. This match took place on May 15th, 2016. It is the only non-tournament match that I am reviewing today, but I just really wanted to watch it even though its a short match. Konami is Kana’s former protege and currently works in REINA, I have no idea who took over her training as Syuri has left REINA in the meantime as well. But she is still a good young talent with a lot of potential. Ohata is one of the feature tag team wrestlers in Joshi but obviously she has aspirations to be more than just a tag team wrestler, she is one of the most popular wrestlers in Pro Wrestling WAVE. Konami goes for Ohata’s arm straight away and puts her in a cross armbreaker, but Ohata rolls to the ropes to get a break. Ohata flings down Konami by her hair and hits a Curb Stomp, cover by Ohata but it gets a two. Irish whip by Ohata but Konami kicks her in the chest and delivers a dropkick. More kicks by Konami and she hits a PK, back up they trade elbows until Ohata hits a running crossbody while Konami is crouched against the ropes. Missile dropkick by Ohata and she goes for a diving body press, but Konami rolls out of the way and hits a running knee for a two count. Konami applies an ankle hold but Ohata gets out of it, high kick by Konami and she applies a fisherman suplex hold for two. Konami goes off the ropes but Ohata catches her with an elbow, rolling double chop by Ohata and she hits a German suplex hold for the three count! Misaki Ohata is the winner. 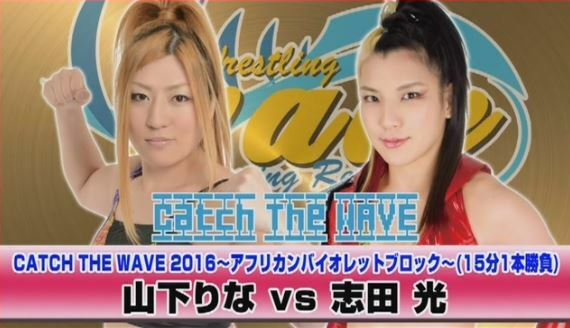 This match took place on May 15th, 2016 and is part of the Catch The WAVE Tournament. ASUKA enters the match with two points, while Chisako has three points. A win by Chisako would give her five points out of a possible six, locking up the Block for her, but the young rookie needs a win too and won’t go down without a fight. We join this one in progress with Chisako attacking ASUKA in the corner, nailing her with a dropkick. Another dropkick by Chisako and she hits a cutter, she goes to the top turnbuckle but ASUKA avoids the diving footstomp. Irish whip by ASUKA and she dropkicks Chisako into the corner, Space Rolling Elbow by Asuka and she dropkicks Chisako for a two count. Hard elbows by Chisako and she dropkicks ASUKA right in the face, Northern Lights Suplex by Chisako but it gets a two count. Chisako goes up top again and this time she nails the diving footstomp, cover by Chisako but ASUKA bridges out of it. Chisako goes for the Hormone Splash but ASUKA rolls out of the way, elbows by Chisako but ASUKA knocks her to the mat with a hard elbow of her own. Scoop slams by ASUKA, she goes up top but Chisako avoids the moonsault. Rolling bodyscissors cover by Chisako for a two, she goes off the ropes but ASUKA kicks her in the head. More superkicks by ASUKA and she hits a gutwrench suplex, but Chisako kicks out of the cover. ASUKA picks up Chisako but Chisako quickly applies a cross armbreaker and she picks up the three count! Chisako wins the match and gets two points. One of the more clipped matches in this airing, but I can say with some confidence that ASUKA is steadily improving. She has always shown a good amount of promise, she missed it here but she has a beautiful moonsault, and Chisako is the type of veteran that will only make her look even better. ASUKA has been wrestling less than a year so there are going to be some growing pains but she looked as good here as you could hope from a 17 year old rookie. Too clipped, but solid action. 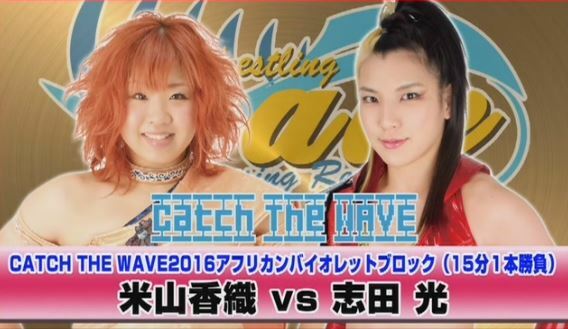 This match took place on May 17th, 2016 and is part of the Catch The WAVE Tournament. Entering the event, Melanie Cruise has no points and Tsukushi has two, this is Cruise’s first match in the tournament though so she is still in control of her own destiny. Melanie Cruise is a six foot tall American wrestler best known for her work in Shimmer, course Tsukushi is an itty bitty so to say there is a size difference would be an understatement. Cruise teases Tsukushi with her height advantage, the referee gets down so that Tsukushi can stand on his back but Cruise pulls her down and tosses Tsukushi across the ring. Tsukushi goes for dropkicks but Cruise shrugs them off at first, they finally start having an impact but Cruise avoids her missile dropkick. Delayed vertical suplex by Cruise and she chokes Tsukushi in the corner, leg drop by Cruise and she covers Tsukushi for two. Backbreaker by Cruise but Tsukushi sends her to the mat with a spinning headscissors, missile dropkick by Tsukushi and she hits a Stunner, elbows by Tsukushi and she boots Cruise in the head. Dropkick by Tsukushi but Cruise catches her when she goes for a missile dropkick. Cruise slams Tsukushi to the mat, Tsukushi goes for a rana but Cruise catches her. Tsukushi rolls down Cruise’s back and applies a wheelbarrow victory roll, but it only gets two. She goes off the ropes again but Cruise boots her in the face. Monster chokeslam but Cruise, and she picks up the three count! Melanie Cruise wins the match and gets two points in the tournament. A bit of a lopsided match, the 18 year old 4’10” wrestler didn’t stand much of a chance against the giant gaijin, but she put up a good fight anyway. Tsukushi got in a few hope spots but I never thought she had a real chance of winning here, Cruise was just too much to overcome. Not quite at squash levels but pretty close, not much to this one aside from Cruise’s great chokeslam. 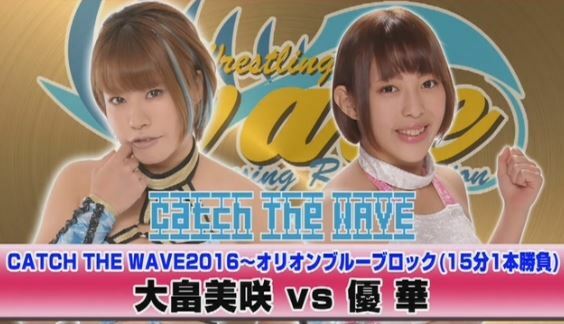 This match took place on May 17th, 2016 and is part of the Catch The WAVE Tournament. 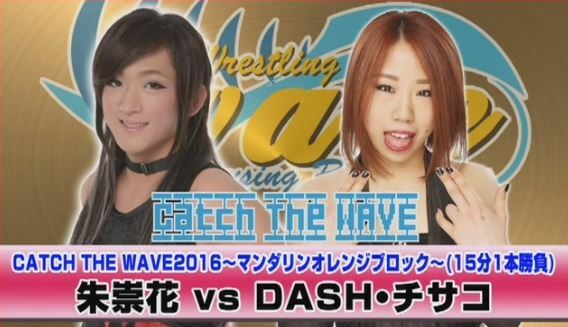 We get the pleasure of a second Ohata match, although this is the first in the tournament. Coming into the match, Ohata has no points and the Ice Ribbon wrestler Yuuka has one, so we are still pretty early in their Block. Still, an early win would go a long way for either wrestler. They immediately start trading elbows, dropkick by Yuuka and Ohata falls out of the ring. Yuuka goes up top but Ohata elbows her to the floor and the pair battle around the ring. Back in, dropkick by Yuuka and she elbows Ohata to the mat before hitting a running Angel Thunder for two. Ohata snaps off a DDT and hits a crossbody while Yuuka is against the ropes, getting a two count of her own. Ohata hits her own Angel Thunder, she goes up top and she hits a diving crossbody. Tornado DDT by Yuuka, she goes up top and she hits her own diving crossbody for two. She goes up top again but Ohata avoids the Angel Thunder, Ohata goes up but Yuuka joins her and hits a Frankensteiner. Yuuka gets on the top turnbuckle and hits the Angel Thunder, but Ohata gets a shoulder up on the cover. Ohata hits a quick headscissors roll-up and a low crossbody, but Yuuka rolls through it. Rolling German suplexes by Ohata but Yuuka applies a bodyscissors roll-up for two. Running elbow by Yuuka and she nails a Jaguar Backdrop Hold, but Ohata gets a shoulder up. Back up they trade elbows and chops, spinning double chop by Ohata and she hits a German suplex hold for two. DDT by Yuuka and she rolls up Ohata with a bridge for a two count, Ohata retakes control and she nails the Sky Blue Suplex Hold for the three count! Misaki Ohata wins the match and gets two points in the tournament. 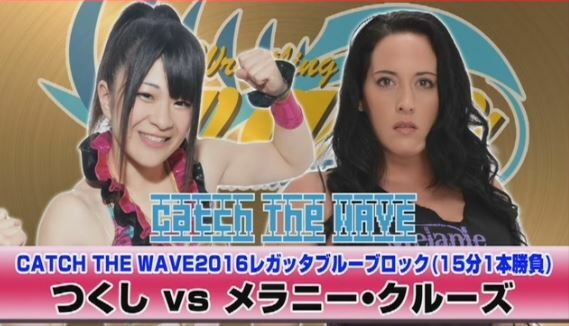 This match took place on May 17th, 2016 and is part of the Catch The WAVE Tournament. This was the main event of the show as well as the last match on this long show I am reviewing, going into the match Nagahama has two points and Sareee has none, so Sareee needs a win if she doesn’t want to fall too far behind the young WAVE wrestler. The young pair start off fast as they trade elbows, both wrestlers throw each other down by the hair until Nagahama hits a dropkick in the corner. Nagahama applies a bodyscissors but Sareee quickly gets out of it, kneelock by Sareee but Nagahama reverses it. Single leg crab hold by Nagahama, but Sareee gets a hand on the ropes. Scoop slam by Sareee but Nagahama hits a few dropkicks, cover by Nagahama but Sareee bridges out of it and hits a dropkick of her own. Back up they trade elbows, jumping elbow by Nagahama and she covers Sareee for two. Sareee shrugs off the suplex and rolls up Nagahama before hitting a quick footstomp. Sareee goes up top and hits a missile dropkick, she gets on the top turnbuckle again and she hits a second one. Both wrestlers go for quick pins with no luck, Northern Lights Suplex by Nagahama but it gets a two. Sareee goes off the ropes and dropkicks Nagahama, but Nagahama comes back with the Kasadora for a two count. German suplex hold by Sareee, she picks up Nagahama and she nails the uranage for the three count! Sareee wins the match and gets two points in the tournament. Well that was a really long review for a bunch of clipped matches, but what a fantastic show. Even though the matches were clipped, most of the matches were still shown close to complete as not all the matches were long in the first place, and the action was non stop and entertaining in just about every match. The young wrestlers (Yamashita, Nagahama, and Sareee) stepped up and the veterans (Chisako, Shida, and Ohata) were their usual awesome selves, making a number of matches that I can easily recommend without hesitation. A great offering by WAVE, lots of quality matches here worth going out of your way to see.